If there's any one item that's taking over my freezer, it's nuts... and lots of them! I have about 7 kinds of nuts chilling out in there (pine, walnuts, almonds, pecans, pistachios, peanuts, and hazelnuts) and I'm always looking for ideas to use them up, especially now before we move. When I found out this week's Tuesdays With Dorie baking challenge was, I was thrilled to finally have a good reason to use some of my nuts up! This week's Tuesdays With Dorie baking challenge is Dorie's Thumbprints for Us Big Guys, chosen by Mike of Ugly Food Dude (who has the recipe within his blog). This recipe was super easy and it's no wonder - it only requires 6 ingredients... 7 if you count the optional powdered sugar. Hazelnuts, flour, butter, sugar, almond and vanilla extract are combined to make the cookie dough. The dough is rolled into a ball and depressions are made before baking. After the cookies have baked and cooled a bit, the depressions are filled with jam. I substituted the jam called for in the original recipe with Nutella since I am still trying to use up pantry items I had on hand before we move. 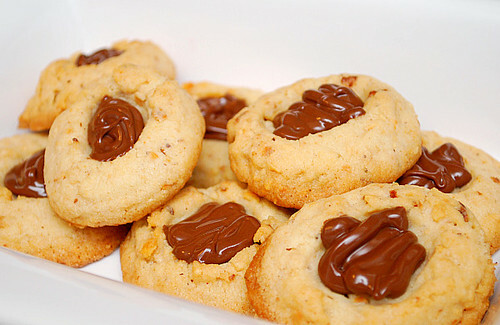 I really enjoyed how easy this cookie was to make and the perfect reason to use up the hazelnuts I had in my freezer. Using Nutella in place of the jam highlighted the hazelnut flavor and besides... Nutella has a way of making sweet baked goods even better! Thanks to Mike for selecting this week's TWD baking challenge. Please check out Mike's blog for the detailed recipe and be sure to take a peek at fellow TWD's to see how their recipe came out! These look ah-mazing! And I love your idea for Nutella. I'm thinking now of making these tonight!